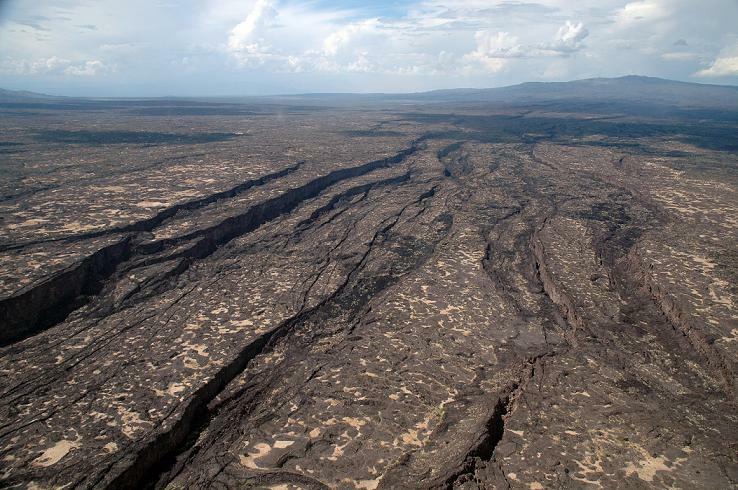 In 2005, a gigantic, 35-mile-long rift broke open the desert ground in Ethiopia. At the time, some geologists believed the rift was the beginning of a new ocean as two parts of the African continent pulled apart, but the claim was controversial. Now, scientists from several countries have confirmed that the volcanic processes at work beneath the Ethiopian rift are nearly identical to those at the bottom of the world's oceans, and the rift is indeed likely the beginning of a new sea. The new study, published in the latest issue of Geophysical Research Letters, suggests that the highly active volcanic boundaries along the edges of tectonic ocean plates may suddenly break apart in large sections, instead of little by little as has been predominantly believed. In addition, such sudden large-scale events on land pose a much more serious hazard to populations living near the rift than would several smaller events, says Cindy Ebinger, professor of earth and environmental sciences at the University of Rochester and co-author of the study. "This work is a breakthrough in our understanding of continental rifting leading to the creation of new ocean basins," says Ken Macdonald, professor emeritus in the Department of Earth Science at the University of California, Santa Barbara, and who is not affiliated with the research. "For the first time they demonstrate that activity on one rift segment can trigger a major episode of magma injection and associated deformation on a neighboring segment. Careful study of the 2005 mega-dike intrusion and its aftermath will continue to provide extraordinary opportunities for learning about continental rifts and mid-ocean ridges." "The whole point of this study is to learn whether what is happening in Ethiopia is like what is happening at the bottom of the ocean where it's almost impossible for us to go," says Ebinger. "We knew that if we could establish that, then Ethiopia would essentially be a unique and superb ocean-ridge laboratory for us. Because of the unprecedented cross-border collaboration behind this research, we now know that the answer is yes, it is analogous." Atalay Ayele, professor at the Addis Ababa University in Ethiopia, led the investigation, painstakingly gathering seismic data surrounding the 2005 event that led to the giant rift opening more than 20 feet in width in just days. Along with the seismic information from Ethiopia, Ayele combined data from neighboring Eritrea with the help of Ghebrebrhan Ogubazghi, professor at the Eritrea Institute of Technology, and from Yemen with the help of Jamal Sholan of the National Yemen Seismological Observatory Center. The map he drew of when and where earthquakes happened in the region fit tremendously well with the more detailed analyses Ebinger has conducted in more recent years. Ayele's reconstruction of events showed that the rift did not open in a series of small earthquakes over an extended period of time, but tore open along its entire 35-mile length in just days. A volcano called Dabbahu at the northern end of the rift erupted first, then magma pushed up through the middle of the rift area and began "unzipping" the rift in both directions, says Ebinger. Since the 2005 event, Ebinger and her colleagues have installed seismometers and measured 12 similar—though dramatically less intense—events. "We know that seafloor ridges are created by a similar intrusion of magma into a rift, but we never knew that a huge length of the ridge could break open at once like this," says Ebinger. She explains that since the areas where the seafloor is spreading are almost always situated under miles of ocean, it's nearly impossible to monitor more than a small section of the ridge at once so there's no way for geologists to know how much of the ridge may break open and spread at any one time. "Seafloor ridges are made up of sections, each of which can be hundreds of miles long. Because of this study, we now know that each one of those segments can tear open in a just a few days." Ebinger and her colleagues are continuing to monitor the area in Ethiopia to learn more about how the magma system beneath the rift evolves as the rift continues to grow.